Are you looking for Kids Party Entertainment Katy TX? We have everything you could ever need at Rock Star Party Bus. In fact, we will bring the party to you and your kids! Normally, in order to find a party of similar degree, you would need to go further past Katy to find it. But not anymore. Rock Star Party Bus will bring an experience fit for a celebrity to your front yard. We know your kids will love it! While we cater primarily to girls, boys are welcome to participate in our party bus experience. We offer packages more suitable for a party comprised of both genders. We want everyone to be able to enjoy this great experience which will make your kids feel like they’re stars. If you call us today, we can get you set up with our great party packages. In this article, we want to talk to you about the rock star experience, what our services are, and how to get into contact with us. Our Spa Bus experience is something that cannot be replicated. It’s one of the greatest adventures that your kids can find this close to home. This is convenient and fun for both of you, and their friends! Take a moment to this about what it is kids love. They want to be a little wild and express themselves in a fun and cool environment. We can give that to them, and you will know they’re comfortably in your front yard. 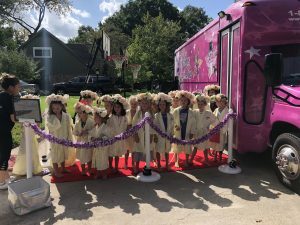 At Rock Star Spa Bus, we believe that making kids feel special is important. We know we would have wanted something similar when we were kids. Your investment in this service will be more than an investment in fun. It will be a memory your child has forever, and they will be reassured that they are special. Our pink bus is fully fitted with luxury seating, mirrors, curtains, and surround sound. Your little darling will never want to leave! We want to tell you about all of the great possibilities during your child’s Rock Star Party Bus experience. Keep in mind, our maximum occupancy is 14 children, and each session lasts for an hour and 45 minutes. Only one adult is allowed for supervision. Your little princess will love our manicure and pedicure service. She and her friends will get to soak, scrub, and get painted up! This is a great way for her to feel pampered, fresh, and expressive. We offer only the finest products during this experience to ensure complete satisfaction and comfort. Do they like hair ties, flower crowns, and extensions? How about our fun pink robes, boas, and t-shirts? We know that dressing up is part of the experience, and we want to provide that. We also have fun glittery make-up options that she and her friends will have fun putting on each other. This experience is fully designed to help them have fun. We are called Rock Star for a reason. Our bus is fully equipped with a surround sound system and TV so that your girls and boys can sing karaoke songs with their favorite artists. After they are fully dressed like the rock stars they are, they will want to utilize this cool feature to take the fun to the next level. Our Neon Glow Party Package is best suited for a group of both boys and girls. Your kids will have a great time dressing up in all of the fun props we offer. Much of these are glow-in-the-dark so that the party can continue even after the bus leaves the venue! We will park right outside your home! Most great kids activities will take you far from home and end up costing you time and travel expenses. While this isn’t completely terrible, it could be much better. We will bring the party right to you! If you have a driveway we can park in, your kids will never have to leave your front yard to have the time of their life. This also saves you the anxiety of worrying about them and what they’re doing. We’ll be so close, all you’ll have to do is open your front door and say hi. Most parties we service happen within a 30-mile range of our Cinco Ranch Location. The closer you are to us, the better! Allow us to come to you and park in your designated lot so we can help these kids have a great time. Although we can take a total of 14 children, most of our packages only cover up to 10. Every additional child will incur a $30 charge to ensure we can provide the best experience. Our bus is very fun, but not as big as we would like it to be! Furthermore, we require a $200 deposit beforehand that goes toward your final total for the experience. If anything were to come up, we ask that you give us 24 hours notice before cancellation. In the case that we cannot make it, we will either reschedule with you or refund your fee. Are you ready to schedule this great experience for your kids? We’re ready to hear from you. Dial 844-GIRL-SPA (4475-772) if you are ready to talk to one of our great You may also fill out our contact form here. We will get in contact with you as soon as possible, because we want this experience to be the best! This is the best Kids Party Entertainment Katy TX has to offer! There are three counties in Katy; Fort Bend, Waller, and Harris. It was named after the “K-T Railroad”. Katy was originally called “Cane Island”, for the cane that grew around the rivers! To learn more about this great city we call home, visit the city website here.